Check out our latest Template: Genius is a beautiful, responsive, and easy-to-use blogger template built with Love. 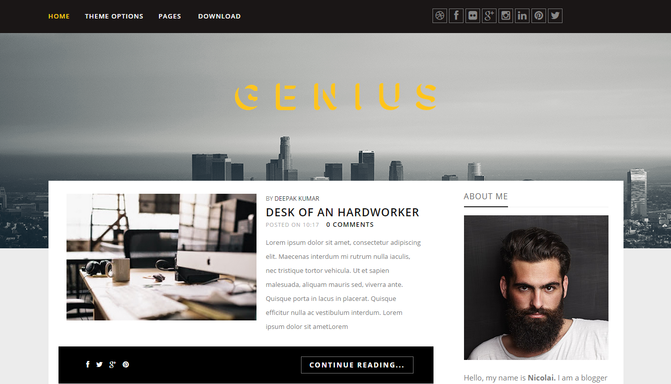 It’s a perfect fit for bloggers, photographers, and artists who need an effortless way to showcase there work.Genius is an Responsive blogger template, with many premium features, the theme is highly optimized for both mobile and desktop platforms. This isn't a wordpress compatible theme is it? I must say a fantastic post. Thanks for sharing. They are utilizing SCSS. Just took a gander at Holly, the greeting page that isn't even scrollable, actually only a header.